Artist's concept of the European Space Agency's Philae lander on Comet 67P/Churyumov-Gerasimenko. Philae touched down on the comet on Nov. 12, 2014; it may actually have bounced off after the initial attempt and come back down again. The European spacecraft that performed the first-ever soft landing on a comet might have done so not just once, but twice. The Philae lander, part of the European Space Agency's (ESA) Rosetta mission, made history Wednesday morning (Nov. 12) when it touched down on Comet 67P/Churyumov-Gerasimenko. But the probe's anchoring harpoons didn't fire as planned, and Philae may have bounced off the surface before settling back onto the icy body once again, mission officials said. Philae separated from the Rosetta mothership around 3:35 a.m. EST (0835 GMT) Wednesday, then slowly spiraled down toward the 2.5-mile-wide (4 kilometers) Comet 67P before landing about 7 hours later. Mission officials originally announced that Philae's harpoons fired, securing the 220-lb. (100 kilograms) probe to the comet. But they soon backtracked and said the anchoring system did not deploy, for reasons that are unclear at the moment. 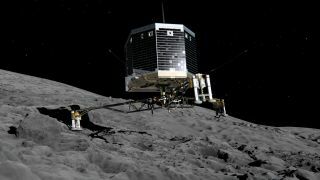 Some data — including fluctuations in Philae's radio-communications link — suggest that the lander lifted off after the initial touchdown, turned slightly and then came down once again, Ulamec said. But he stressed that this scenario remains speculation for now. "We still do not fully understand what happened," he said. "It's not so easy to interpret, but tomorrow morning, we should know a lot more." Communications between Philae and mission controllers are suspended for now because the Rosetta mothership, which is orbiting 67P, went behind the comet's horizon, Ulamec said. The link should be re-established by Thursday morning (Nov. 13), he added. Mission officials will provide an update during a news conference Thursday at 8 a.m. EST (1300 GMT). You can watch it live here on Space.com, courtesy of ESA. Philae hit its target location on Comet 67P precisely during the initial touchdown, ESA officials said. And the lander appears to be in good working condition; it has sent back some science and "housekeeping" data already, Ulamec said. Still, he and other officials stressed that more analysis is required to determine Philae's status and fate. The $1.3 billion Rosetta mission launched in March 2004 and then rendezvoused with 67P in deep space this past August. On Aug. 6, Rosetta became the first spacecraft ever to enter orbit around a comet. The mission's main goal is to learn more about the composition and behavior of comets, which are icy remnants left over from the solar system's formation 4.6 billion years ago. Rosetta is gathering data from orbit, while the plan calls for Philae to photograph and collect samples from 67P's surface. The mission is expected to last at least through December 2015 — four months after 67P makes its closest approach to the sun. The comet takes 6.5 years to complete one orbit, and its path takes 67P as close to our star as 115 million miles (186 million km) — about 1.25 times the sun-Earth distance.